Since this article was originally written many things have happened. The most important was the meeting between the Governor of Hawaii and the people of Kauai. Fortunately, that dialog changed some minds. The Superferry won’t be coming to Kauai for the immediate future and until the circumstances change. In the meantime court proceedings and economic forces may further change the landscape of the project. We must praise the Governor Linda Lingle for being part of a responsive and reasoned reaction to the heartfelt expressions by he people of Kauai on Thursday night. "If brute force is not working - you are not using enough of it!" Last Thursday night, at the Peace & Freedom Convention Hall in Lihue, the people of Kauai overflowed the arena to meet with the Unified Command. The original agenda was for the Governor to tell Kauai residents about the regulations to restrict our activities in the Emergency Security Zone, then describe the lethal forces arrayed to stop our “illegal” activities and finally explain the punishment for violating those regulations. Then she would take questions from the public on the security issues. That was not the meeting the people of Kauai had in mind. It was overwhelmingly clear that Kauai still demands an EA and EIS be done before Superferry operations start here. “EIS First! “ was the chant. It was clear to the Unified Command that intimidation and fear mongering were not going to work. There will be many that still plan to challenge the authorities on the entry of the Superferry to our harbor with their bodies. I respect their commitment to peaceful civil disobedience, including paddling out in front of the Superferry to keep it from docking. There also will be USCG and police who believe it is their duty to stop them and imperil themselves in order to do their job. I respect their commitment too. What people on both sides of the issue need to do now is imagine a new course of events and act on it. 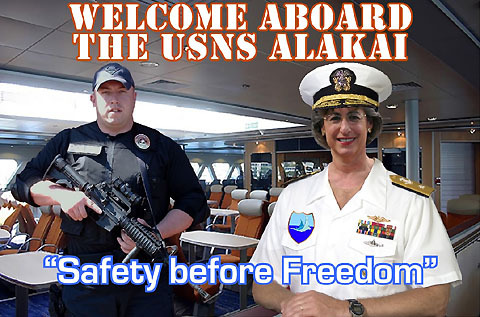 Sadly, Governor Linda Lingle has been a central player is a series of bad judgment calls that are likely to do irreparable damage to her political career because of her uncompromising support of the Superferry. The Governor made a commitment to lower or avoid whatever "red tape" the Superferry might encounter to get it into the earliest possible service. This meant not only performing a lot of media boosterism, but also influencing the HDOT to put aside its requirement for an Environmental Assessment (EA) that would likely touch off a more detailed Environmental Impact Statement EIS). After the green flags were waved for the Superferry to go-ahead, the Governor simply ignored all reasonable concerns of the outer island governments, environmental experts, and the public. The “Big Lie” machine was rolled out and misrepresented many things, like the connection between the Superferry and its use by the military, as well as the ability of the ferry to avoid whales in the dark at 40 mph. In addition, we hear from Sean Connaughton, Maritime Administrator of the U.S. Department of Transportation, that although he wanted assurance that there would be no encumbrances (like a pesky EIS) on the loan guarantee his agency was providing, he never insisted that the Lingle Administration break Hawaii's laws to evade environmental reviews. 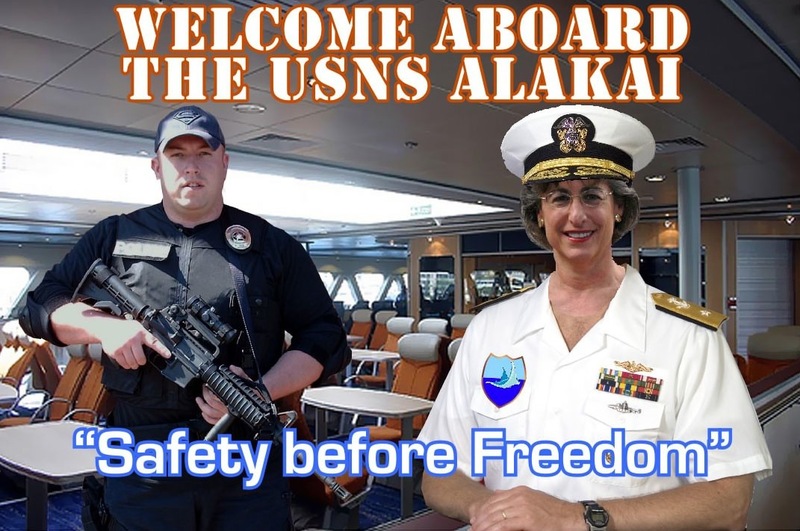 Moreover, it appears it was not the idea of Rear Admiral Sally Brice-O'Hara, of the USCG, to set up a Nawiliwili Harbor Emergency Security Zone without following of normal USCG regulations (like a 30 day notification period). It was Governor Lingle who went over Brice-O'Hara's head, to Homeland Security, to jam that through. What’s the rush? The embarrassment of two "naval defeats" on Kauai? We must hope that cooler heads, in court and behind the scenes, can prevail. The Superferry issue is not over yet. We must be vigilant not let it slip under the door while we celebrate or independence and unity. Until the issue is really resolved, we can still push forward to make headway. For those souls not ready to face the guns and holding cells of Lingle's Police State, I have a few suggestions on strategies to counter the Unified Command. I am writing this before Saturday’s scheduled Nawiliwili Freedom Festival. I like what the planners are suggesting and am sure it will be an expression of the good will and joy felt by many who live on Kauai. I suggest more people get involved with Nawiliwili Harbor - the park, the jetty, the beach and the regional watershed. Celebrate this place. Let's show what freedom and joy look like in contrast to the Police State that will be shutting down the small boat harbor, canceling canoe club events, eliminating jetty fishing, Infringing on public park use while the Superferry is in port. Bring to pressure to bear on Kauai Mayor Brian Baptiste to disengage from the Unified Command. It is a threat to the people of Kauai. He claims to be ‘neutral’, seeking the "safety" of all. This kind to safety is “Safety before Justice” and “Safety before Freedom”. While the mayor was preparing himself to represent the Unified Command at the Convention Center, JoAnn Yukimura was doing his job with cool headed leadership before a thousand concerned residents in front of the Old County Building. We need Mayor Baptiste to lead and make a real commitment to defend Kauai. He should be emphasizing the unanimous vote of our County Council (and Kauai State Legislators) that the Superferry undergo an EIS before entering our harbor. He should be advising Lingle that a court case is underway here that will determine whether the Superferry should come to Kauai and that in the meantime she should “chill”. a) carry no vehicles to or from Kauai. b) travel no faster than the cruising speed of other visiting passenger ships. c) there be no special Security Zone when the Superferry is in harbor. Following these constraints make Superferry no different from other passenger ships now serving Kauai. These are completely reasonable requests that fall far short of a temporary restraining order or an injunction stopping Superferry operations. Come and witness the Kauai Circuit Court hearing on an injunction that continues this coming week. Show we are solidly behind a court ordered restriction on Superferry service to Kauai until all environmental studies that are required are complete. If there is a resumption of service to Kauai be ready to come together again and show we are not afraid and are resilient. What can Lingle do now? Take a deep breath. Listen to the people in Hawaii who you respect. The business representatives of the tourist industry must be telling you that you are damaging the biggest business in the state by shoving the Superferry down our throats with gunships in a combat zone. The Supreme Court has determined that the decision, by HDOT Director Barry Fukunaga, not to do an EA was in violation of the law. You and he were wrong and you must deal with it now. In regard to our protest, you lecture us about the importance of safety. Certainly, the only “safe” course would be to not let the ferry sail until the EA determined it was “safe” for the environment of Kauai. There should be no rush here. The Superferry can wait another few weeks until the courts make their rulings on whether there can be service before an EA. Allow this brouhaha to settle down by letting the Superferry "volunteer" not to sail here until after Kauai Circuit Court Judge, Randall Valenciano, determines if there will be an injunction stopping service. There's plenty of room available for you to compromise – use it. The Superferry could even begin operations under some circumstance. Revisit item #3 above. Governor, I agree with you that surface transportation between the islands is in our future... but not with this high-speed Littoral Combat Ship. You should look at this as a chance to turn lemons into lemonade. You could advocate selling the two Superferrys to Blackwater Coproration or the Navy. Then a rational alternative to this ferry, not tied to the Stryker Brigade, could be designed with environmental sustainability in mind. Kauai and Hawaii Nei would welcome it and praise you.